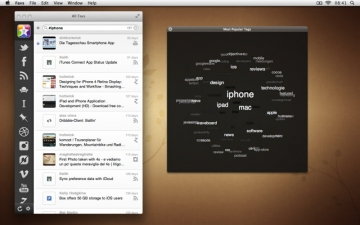 Favs | Mac App Storeのアプリ検索・ランキング BuzzMac! The app for your likes, stars, social bookmarks and favorites. If you are using social networks, you are also creating favorites. On Facebook you ‘like’, on Twitter and Google Reader you ‘star’, on Delicious and Pinboard you ‘bookmark’ and so on. 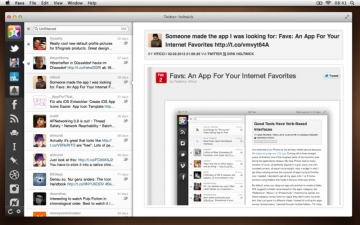 Instead of spreading your favorites across different networks, use Favs to sync them to your Mac. Don't waste any more time on searching for your favorite content - Favs has a powerful search feature build right into the application that makes finding what you like a breeze. Many favorites are public, for example on Twitter, Flickr or Vimeo. 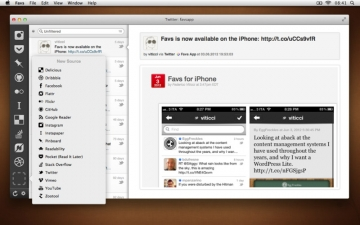 This allows you to follow the favorites of persons you like and just see their hand-picked articles. For those sources Favs marks new entries as ‘unread’ and you can use Favs as a sophisticated Reader app. Preview at favsapp.com and learn more about the powerful search and other features. bruhitzmom (Tara °o°)@CydonPrax I haven’t tried the Mac and cheese (I don’t like really hot stuff), but the other two are my favs!